High quality Aluminum material:Made of high quality and solid aluminum,design with bridging structure for solid foundation for your laptop. Ergonomic Design for Comfort:This laptop stand gives you a great height for comfortable typing and viewing,relieving your neck fatigue,really a ergonomic workspace for laptop users. The cable pass:Through the back hole, keep your cables neatly gathered for a clutter-free workspace. Specialized hollow design:Help cool down the laptop more efficiently. Compatibility:Apple Macbooks (Pro/Air/Retina),Dell XPS series / HP Envy series / Samsung Notebook 9 / Lenovo Yoga 4 Pro / Acer Aspire S, Aspire V mtro / Asus ZEN Book U series / Surface Book series / Google Chrome Book series. All 13 to 18 inch laptop. Ergonomics Design---Raise your screen height to eye level to minimize neck fatigue and reduce neck strain,eye strain. Hollow design makes your laptop dissipate heat rapidly,avoid any damage to your laptop. 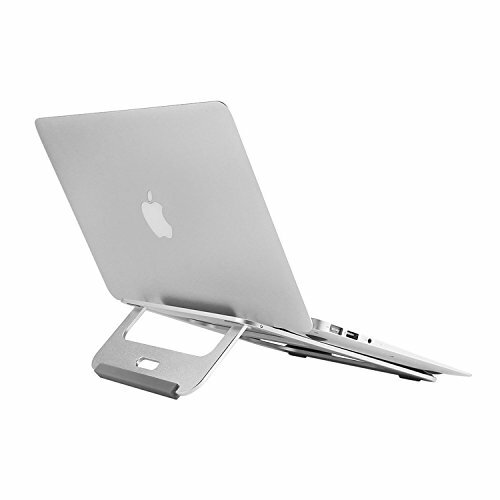 Foldable and portable laptop stand,perfectly fit your backpack or luggage,convenient for daily carry and travel. Compatibility---Designed for Apple Macbook Air, Macbook Pro,and all Apple devices,also compatible with other laptops with sizes less than 18 inches.